Indie Retro News: Indie Retro News and RGDS Podcast Amiga Album Special! Indie Retro News and RGDS Podcast Amiga Album Special! As you well know I am a huge fan of the C64 to Amiga conversion tracks done by Aaron White of RGDS Podcast. Month after month he has done his own flavoured remixes and full conversions from classics that are well known in the retro gaming scene such as Bruce Lee, Paper Boy, Flimbo's Quest, Shinobi, Pacland and New Zealand Story. He has even does his own sampled mixes of classic 90's dance tracks. But from this I sent him a challenge, I wanted him to do an Indie Retro News special, a special that is full of my personal choices that not only sound upbeat on the C64 but could almost be worthy of being played through a hi-fi system. But that's not all, I wanted to see if he could remix a PC cracktro tune and sure enough, he has gone beyond my expectations and fulfilled my every request. This is the ' Indie Retro News & RGDS Podcast Amiga Album Special ' , a 9 track ADF file that features some of the greatest upbeat tracks from the 80s, and 90's that I have ever listened to being blasted from the Amiga. 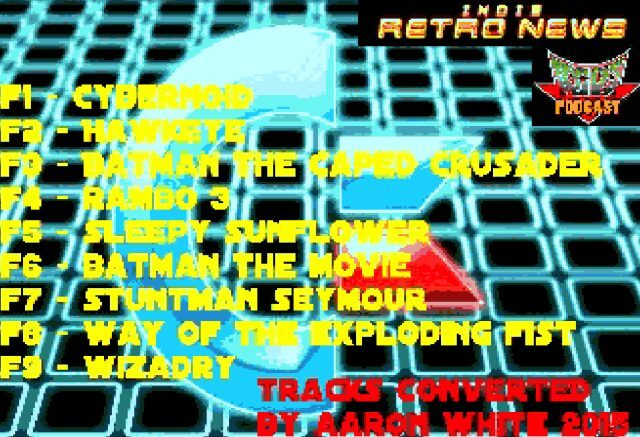 Tracks such as Cybernoid, Hawkeye, Batman The Caped Crusader, Rambo 3, Sleepy Sunflower, Batman The Movie, Stuntman Seymour, Way of the Exploding Fist and Wizardry. But my question to you is, which of these tracks is the cracktro tune?